Conceptual diagram of an end-to-end data development-stewardship-application process. It is organized as processes, functional entities, information packages, roles, and organization entities of data development; data management, preservation, and stewardship; data distribution; and data application systems. Constructed and modified from the concepts and frameworks of ISO 14721 standards (CCSDS, 2012). Dot-shaded columns denote potential interfaces between different functional entities, roles, and organization entities. As the volume of environmental data expands exponentially, and as the ways data are preserved and delivered evolve rapidly, organizations charged with managing these datasets face many challenges. A new paper in D-Lib Magazine lays out recommendations for meeting the challenges of this new era of Big Data and Open Data, including a framework of recommended roles, responsibilities, and skillsets for those tasked with stewarding these critical information resources. 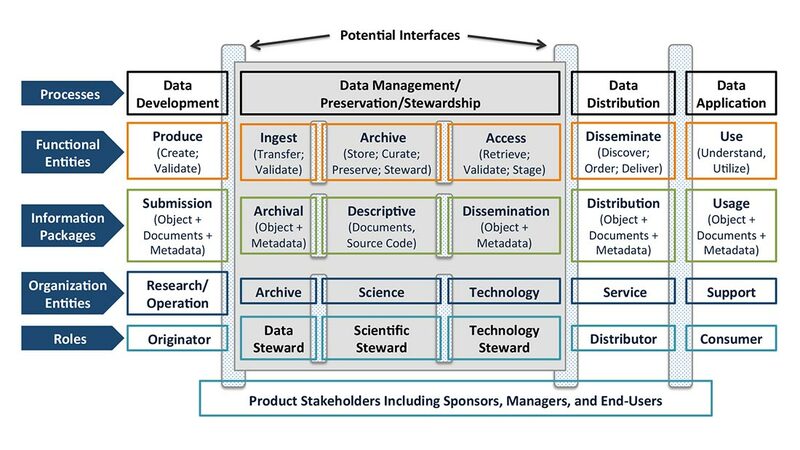 The authors suggest that the responsibilities for long-term scientific data stewardship be distributed across three roles: data stewards, who are responsible for managing datasets and metadata; scientific stewards, responsible for managing the quality and usability of the data; and technology stewards, responsible for the tools and systems required to manage the data. In order to fulfill those roles, the authors argue that each of these stewards should be subject matter experts in their own domain, while having at least general knowledge of the other domains; have a mindset of caring for the data and related assets; and be able to communicate within and across these various knowledge domains. 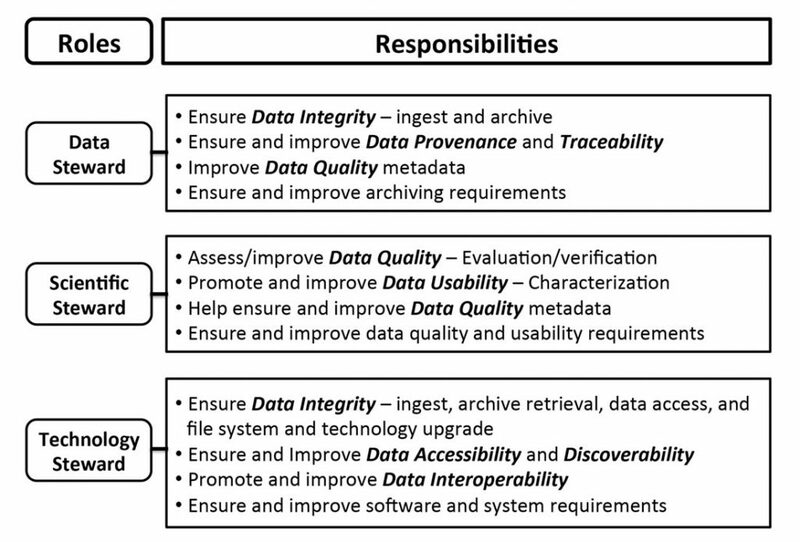 Diagram of responsibilities of data stewards (top), scientific stewards (middle), and technology stewards (bottom) in ensuring and improving data quality and usability. The paper also suggests high-level responsibilities for other stakeholders in the process, ranging from data originators to end users. Ultimately, the authors hope that defining these roles and responsibilities will facilitate the successful cross-disciplinary communication and efficient resource allocation needed to meet the challenges of effectively stewarding digital environmental data. The author team was led by CICS-NC’s Ge Peng and included Nancy Ritchey, Kenneth Casey, Edward Kearns, Jeffrey Privette, Drew Saunders, and Steve Ansari of NOAA National Centers for Environmental Information; Philip Jones of STG Inc.; and CICS-NC’s Tom Maycock.